Back in the late 1990s Dan and I lived in an area that experienced severe drought for a number of years. At the time we had well water, and so could water our garden without worrying about our water bill. Our next door neighbor was a well-respected old-timer who knew everybody in the county. One day he and Dan were talking about our gardens and he told Dan about a lady he knew who had decided to give up on growing food because of the drought. She couldn't grow food so she was just going to buy food from the grocery store. Our neighbor chuckled over that and said, "Doesn't she realize that food in the grocery store has to be grown too?" Last summer was a tough year for gardeners all over the country. It was either too hot, too dry, or too rainy for almost anybody's garden to produce well. I daresay that most of us who rely on growing our own food had to dip more deeply into our pantries and supplement more from the grocery store. I'm sure we're all wondering what this summer will bring! 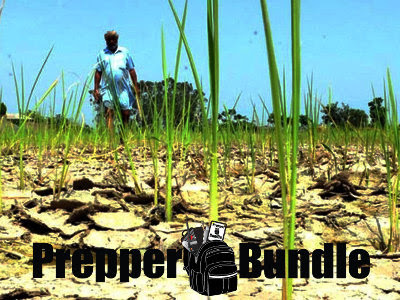 So that brings me to food preparedness and how the PrepperBundle can help. It contains some good books on food storage, and also a few that touch on things we don't always think about. 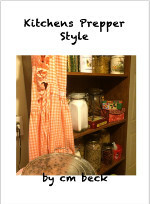 Kitchens Prepper Style by CM Beck starts with her idea of the ideal prepper's kitchen and then explores alternate cooking methods, cookware, and utensils. One statement that caught my attention was what she said about water safety, "The Red Cross advises boiling water for use in an emergency, but boiling water will make chemicals more saturated. This method will kill bacteria though." What's the answer? She recommends distilling water before using. I thought the book was quite thorough in things a prepper needs to consider for her or his kitchen. Plus it contains a lot of good tips on frugal stock-up shopping. Do you remember in the solar cooking class when Paul explained how a Sun Oven could be used as a "Wonder Box?" 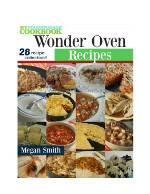 Consequently, I was very pleased to find Megan Smith's Wonder Oven Recipes in the bundle. What is a wonder oven (or box)? It's a method of cooking that utilizes retained heat in partially cooked items to finish the cooking. It can save up to 50% on fuel or heating costs. The book tells you how to make your own easy "wonder box," explains the basic concepts, and then gives 28 recipes. I plan to try this with my Sun Oven! The Mini Seed Saving Course by Melissa K Norris gives you access to her online seed saving course (of course). I haven't taken it yet, but plan to. This just makes sense for any gardener/prepper, so I look forward to any new tips I can get! 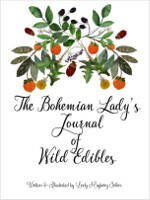 I also have to mention this book, The Bohemian Lady's Journal of Wild Edibles by Lindy Mayberry Sellers. Not just because foraging is an important preparedness skill to learn, but because the water color illustrations are absolutely gorgeous! Recipes are included for each of the common wild plants presented. Click here to see everything that's included in the bundle, plus options available and pricing. Or click here to head on over to the PrepperBundle website. Or, stay tuned for a few more reviews on the PrepperBundle books. Very interesting, thank you. My grandmother lived on a bleak hillside in the north of England, and having virtually no pension, grew and produced her own food. She used to filter her well water through a charcoal filter, and only boiled water when needed for cold drinking. She also used a hay box ie a box thickly lined with hay into which she would place a lidded pot with hot food, to finish cooking. She used to forage, and trained her little terrier to go and catch rabbits for the pot. Must be where I get my frugality from! Oh my, I would have loved to meet your grandmother! Sounds like my kind of gal. You should consider writing about her for a book. I think a lot of people would be interested, and then you can participate as an author in next year's PrepperBundle! After several poor years for us, last year was very bountiful for us. (Sorry we took all your rain!) Not only did we have a record crop harvest but we really packed in the garden produce as well. My canning shelves are still pretty full so hopefully we can go another couple years if we have too. Hopefully this year will be the bountiful year for your garden. Ed, I don't begrudge you your plentiful rain and bountiful garden! Just hoping we do better this year, at least in the vegetable department. Amazingly, our fruit and nut trees did really well, in spite of the heat and lack of rain. I'm guessing it was from good subsoil saturation after a very rainy winter. So far so good, so we'll just have to wait and see.